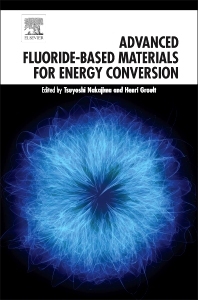 Advanced Fluoride-Based Materials for Energy Conversion provides thorough and applied information on new fluorinated materials for chemical energy devices, exploring the electrochemical properties and behavior of fluorinated materials in lithium ion and sodium ion batteries, fluoropolymers in fuel cells, and fluorinated carbon in capacitors, while also exploring synthesis applications, and both safety and stability issues. As electronic devices, from cell phones to hybrid and electric vehicles, are increasingly common and prevalent in modern lives and require dependable, stable chemical energy devices with high-level functions are becoming increasingly important. As research and development in this area progresses rapidly, fluorine compounds play a critical role in this rapid progression. Fluorine, with its small size and the highest electronegativity, yields stable compounds under various conditions for utilization as electrodes, electrolytes, and membranes in energy devices. The book is an ideal reference for the chemist, researcher, technician, or academic, presenting valuable, current insights into the synthesis of fluorine compounds and fluorination reactions using fluorinating agents.